Science is increasingly focusing on whole environments – ranging from our guts to the ocean – exploring how all the parts of a system work together to function in a healthy way. 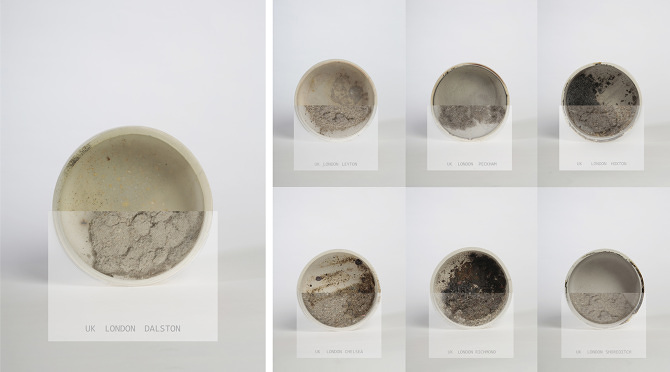 Lucie Libotte’s 2014 work, Dust Matters, now on exhibit at the Science Gallery in Dublin, creates art from one of the inescapable elements of our domestic environment – dust. HOME\SICK, which runs through July 17, features the work of many other artists, scientists and designers, including the microbial bellybutton stylings of Finch & Pea friends Rob Dunn and Holly Menninger of North Carolina State University. You can get lots more information about the show at the Science Gallery website. This entry was posted in The Art of Science and tagged Dust art, Lucie Libotte, MicroBEnet, microbiome art, science art, Science Gallry. Bookmark the permalink.